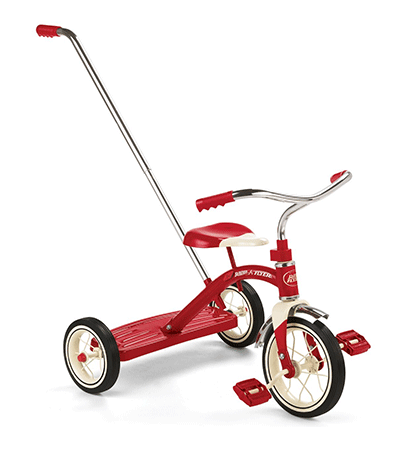 Toddlers and preschoolers love tricycles as they develop gross motor skills and build independence. Most kids can pedal and steer around age three, but some are ready for a trike much earlier. Remember: no matter what kind you choose, ALL kids need to wear a well-fitting helmet on every ride! To decide which tricycle is right for your child, think about three questions: how big is my child? Where is my child most likely to ride? How much use will it get? If you have a small child, look for safety features that help them stay seated. If you ride outside, look for sun shades and parent handles. Families who want to get years of use should look for study, adjustable tricycles that can grow with their children. Here are ten of the best tricycles of 2017 to help start your search. 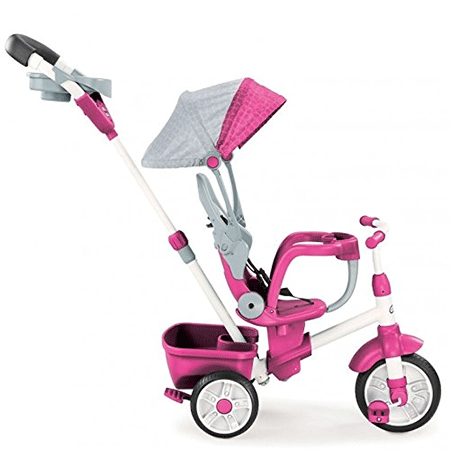 This tricycle has features for both parents and children with a removable parent steering handle that lets you push while your child uses the pedals as footrests. 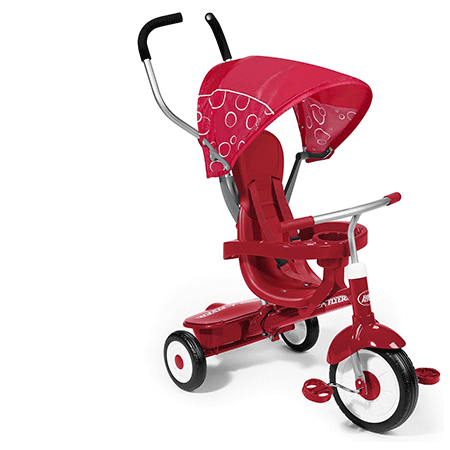 The durable molded wheels and adjustable grow-with-me seat are plastic, which means this trike won’t tire out your tot or the adult who pushes her home. A fun covered bin holds snacks and keys on the go. 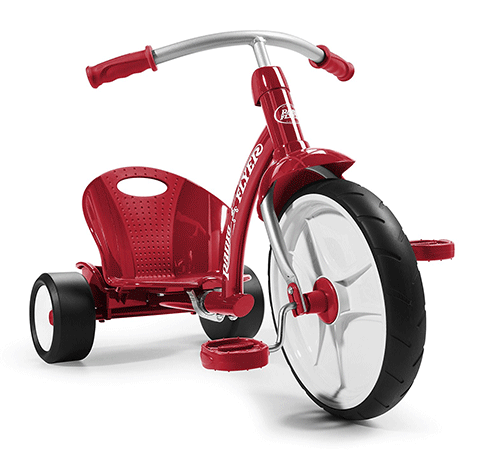 This tricycle is called a flyer for a reason: the performance grip tread and low center of gravity make it possible to really pick up speed! The sturdy steel frame expands as your child grows up to 49 pounds. The small storage bin in the back provides a place for stuffed animals and toys. 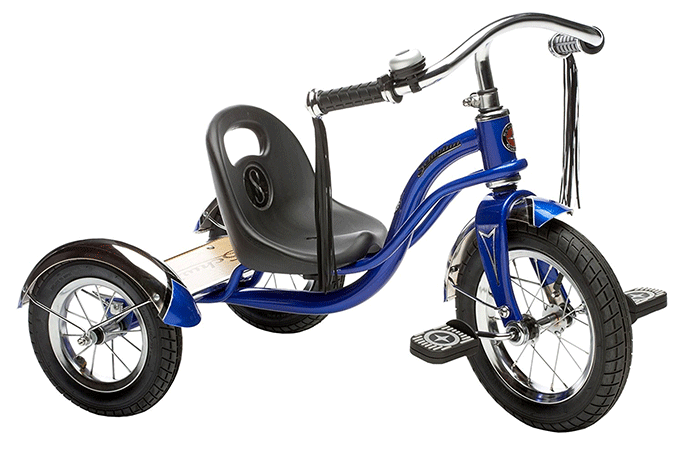 This trike is definitely for bigger kids as toddlers can’t reach the pedals. 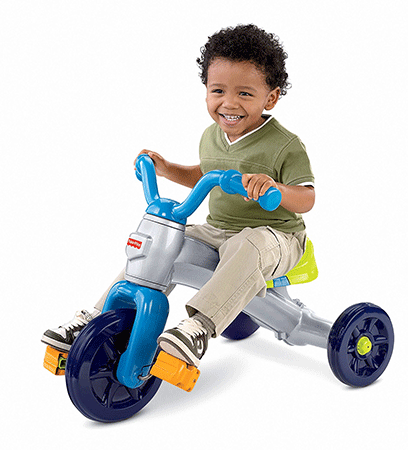 This trike sets the stage to enjoy a ride without the frustration of a complicated trike. The Grow With Me feature starts with thick handles and pedal blocks that are easy for young toddlers to grab and push. Then, as your child grows, the seat can be adjusted and the block pedals removed. The lightweight plastic is perfect for living rooms and driveways. This tricycle is perfect for kids who want a trike but still need a stroller. Toddlers love the high-backed seat that keeps them safe with a three-point seatbelt and removable lap tray. Little feet can rest on the removable full foot platform in the shade of the full canopy that protects from all angles. Parents love the padded push handle with a large parent storage bucket and bottle holder. 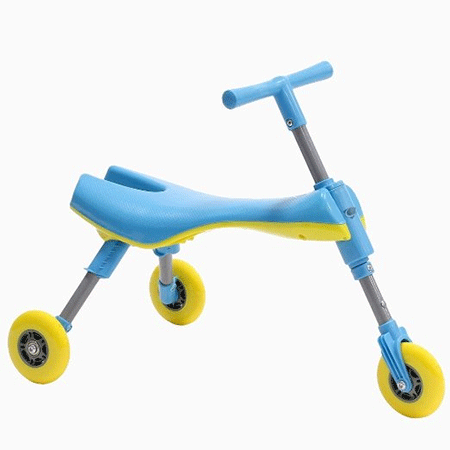 As your child grows, use the flip switch adjustable seat and removable elements to transform the trike through four stages. A classic with a functional twist! 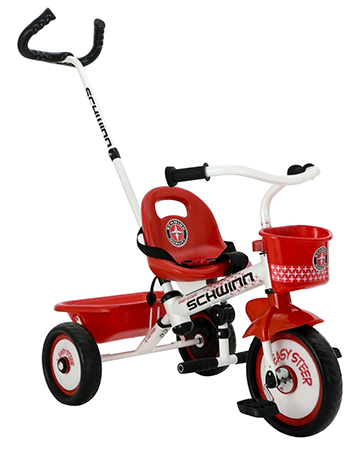 The adjustable seat and 10-inch front wheel make this tricycle appropriate for ages 2-4 or a weight capacity of 42.5 lbs. This trike looks great with its chrome handlebars, fenders and vintage details. Solid rubber tires and steel spoked wheels provide a smooth ride. A removable adult handle adjusts to three positions. The combination of a heavy frame with lighter plastic seats and bins creates a stable trike that’s not too heavy for kids. A removable handle allows adults to push or take over steering control. A gravity dump storage bin in back and front handlebar basket provide plenty of space for treasures on a walk. The optional seatbelt and molded seat keep younger riders safe while riding. This vintage design stands the test of time. Glossy red steel, ringing chrome bell, and flowing handlebar tassels draw the eyes. Classic construction provides a sturdy dependable ride. The adjustable seat grows with children who love climbing on and off from the double-deck rear step. The rubber tires give a smooth ride even on bumpy sidewalks. This space age trike has no pedals and is ready to ride right out of the box. Kids use their feet to push off and stop, putting the focus on balance and steering. Wheels are streamlined for a smooth, quiet ride and the entire lightweight trike can be folded in seconds for a quick clean up. If your little racer (or daddy!) is into classic cars and beefy bikes, this flashy low rider might be the tricycle for you. A low center of gravity reduces tip-overs and a sculpted seat adjusts for height and comfort. All materials are top of the line: chrome handlebars, full-steel heavy-duty construction with a real wood deck and custom-looking finishes like a burned-in logo, long tassels and a bell. 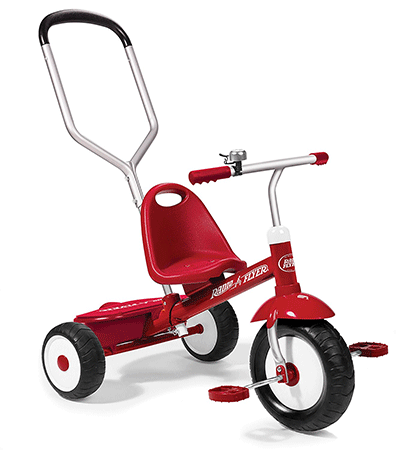 This trike combines the classic red radio flyer look with all the upgrades and comfort features possible. 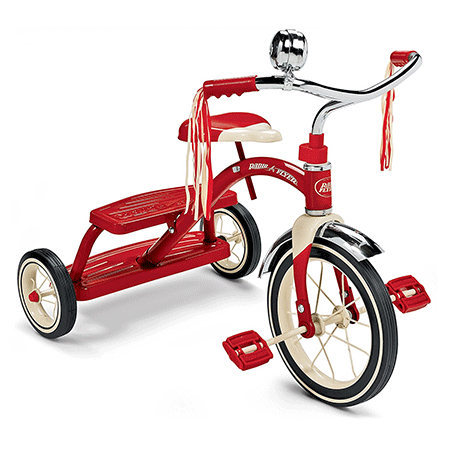 It has four adjustable stages from a pushed infant trike all the way to a classic trike that preschoolers can ride independently. For the youngest riders, it features a 3-point harness and high seat back along with a removable safety tray. Bring all your snacks along for the ride with the cup holder and covered storage bin. A canopy provides UV protection and the adult Steer and Stroll adjustable push handle lets toddlers kick back while mom or dad takes a turn driving from behind. There are plenty of tricycles on the market, most with affordable prices and easy assembly. Choose a trike that will fit your child’s needs for their size and developmental abilities as well as your location and the types of riding your family will do. Any of these tricycles will delight and entertain your child for hours so grab a water bottle and your helmets and enjoy the ride!